In my case the Echo Link took Spotfiy’s 320 kbps stream and opened it up. The Link creates a wider soundstage and makes the music a bit more full and expansive. The bass hits a touch harder and the highs now have a new-found crispness. Lyrics are clearer and easier to pick apart. The differences are subtle. Everything is just slightly improved over the sound quailty found when using an Echo Dot’s 3.5mm output. Don’t have a set of nice speakers? That’s okay, Amazon also just released the Echo Link Amp, which features a built-in amplifier capable of powering a set of small speakers (read the review here). Here’s the thing: I’m surprised Amazon is making the Echo Link. The device caters to what must be a small demographic of Echo owners looking to improve the quality of Pandora or Spotify when using an audio system. And yet, without support for local or streaming high resolution audio, it’s not good enough for audiophiles. This is for wannabe audiophiles. Hey, that’s me. There are Echo’s scattered throughout my house. The devices provide a fantastic way to access music and NPR. The tiny Echo Link is perfect for the system in my office where I have a pair of Definitive Technology bookshelf speakers powered by an Onkyo receiver and amp. I have a turntable and SACD player connected to the receiver but those are a hassle when I’m at my desk. The majority of the time I listen to Spotify through the Amazon Echo Input. To be clear the $200 Echo Link does not provide a night and day difference in my audio quality. It’s a slight upgrade over the audio outputted by a $20 Echo Input — and don’t forget, an Echo device (like the $20 Echo Input) is required to make the Echo Link work. The Echo Link provides the extra juice lacking from the Echo Input or Dot. Those less expensive options output audio to an audio system, but only through an analog connection. The Echo Link offers a digital connection through Toslink or Digital Coax. It has analog outputs that’s powered by a DAC with a superior dynamic range and total harmonic distortion found in the Input or Dot. It’s an easy way to improve the quality of music from streaming services. I’ll leave it up to you to justify the cost. To me, as someone who has invested money into a quality audio system, the extra cost of the Echo Link is worth it. But to others an Echo Dot could be enough. It’s important to note that the Echo Link works a bit differently than other Echo devices connected to an audio system. When, say, a Dot is connected to an audio system, the internal speakers are turned off and all of the audio is sent to the system. The Echo Link doesn’t have to override the companion Echo. When an Echo Link is connected to an Echo device, the Echo still responds through its internal speakers; only music is sent to the Echo Link. For example, when the Echo is asked about the weather, the forecast is played back through the speakers in the Echo and not the audio system connected to the Echo Link. In most cases this allows the owner to turn off the high-power speakers and still have access to voice commands on the Echo. The Echo Link takes streaming music and instantly improves the quality. In my case the improvements were slight but noticeable. It works with all the streaming services supported by Echo devices, but it’s important to note it does not work with Tidal’s high-res Master Audio tracks. The best the Echo Link can do is 320 kbps from Spotify or Tidal. This is a limiting factor and it’s not surprising. If the Echo Link supported Tidal’s Master Tracks, I would likely sign up for that service, and that is not in the best interest of Amazon which hopes I sign up for Amazon Music Unlimited. The Link is interesting. Google doesn’t have anything similar in its Google Home Line. The Sonos Amp is similar, but with a built-in amplifier, it’s a closer competitor to the Echo Link Amp. 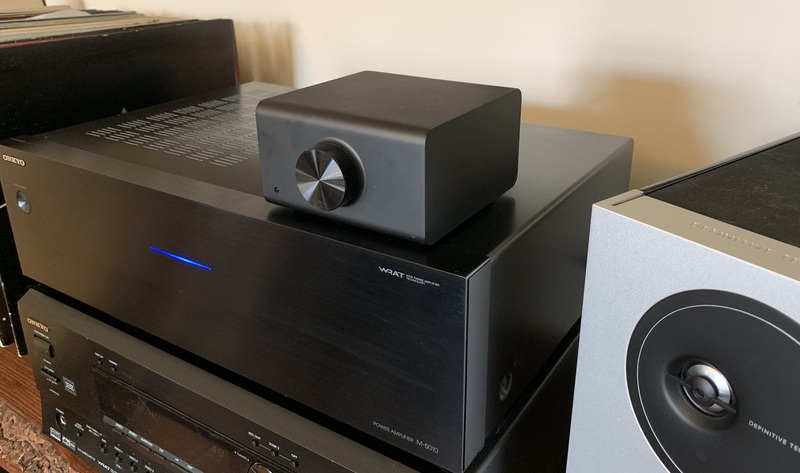 Several high-end audio companies sell components that can stream audio over digital connections yet none are as easy to use or as inexpensive as the Echo Link. The Echo Link is the easiest way to improve the sound of streaming music services.